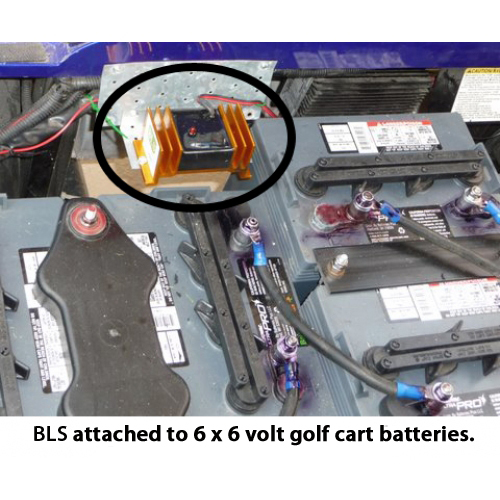 Batteries in a RV can be expensive, difficult to replace, and at times, unreliable. Most RV’s have house batteries along with starter batteries. The house battery bank is usually made up of 4 to 6 deep cycle batteries that are used to run common electronics when not connected to AC power. The average life of good quality deep cycle battery’s is 3 years, with each battery costing between $120 and $200 per battery. 80 % of lead-acid batteries fail prematurely due to the build-up of lead sulfate crystals on the battery plates. This build-up makes batteries unusable at approximately 1/3 of their natural life. The Battery Life Saver (BLS) handles this problem. Using U.S. Patented technology, the BLS sends a frequency signal that matches the resonant frequency of the sulfate crystals (think of an opera singer breaking a wine glass). This dissolves the sulfate crystals rejuvenating both the electrolyte and the lead plates. The BLS will rejuvenated old “dead” lead-acid batteries and extend the life of new or good working batteries. We have records of the BLS tripling normal battery life. The BLS will allow for shorter charge times, longer runs times, lower water consumption and most importantly, longer battery life. Easy to use, attach it and forget it. No chemicals needed, it is an external device. By constantly dissolving sulfate crystals, the BLS can double and sometimes triple battery life. This can save you $1000’s over time and you will be helping to save the environment from harmful battery waste. 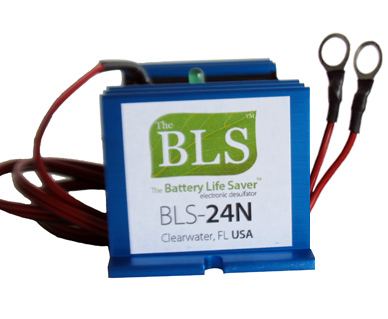 Only one BLS is needed per battery system. Easy Do it Yourself Instructions, if you can connect jumper cables you can connect the BLS! For 12 and 24 volt battery systems and vehicles with multiple batteries. Most commonly used on RV’s and marine applications. Can be installed permanently on a battery system. The system should be charged regularly. Similar to the BLS-12/24B, but comes with 3/8″ eye rings for attachment to the battery terminals. Designed for a 24 volt battery or battery bank. Can be instailled permanently to keep the batteries in optimal condition and extend battery life. Should be installed on new or good working batteries (use the BLS-12/24 to rejuvenate old batteries). Equipped with a low voltage cutoff. I wanted to call and give you a report on your Battery Life Saver. I was very skeptical when I ordered the BLS from you, knowing that there was a money back guarantee, I decided to give it a try. I have 6 x 6 volt batteries in my R.V., all with very poor specific gravity readings. After using the BLS for a month and a half, all the batteries are now reading close to new batteries. I am very happy with the results and I will try to spread the word as much as I can. Thank you. are. When adding distilled water to the house (golf) batteries, I noticed that the plates where 100% clean. I hope to make them last as long as possible. Thank you.